As the breeding season approaches, producers should be concerned with the body condition of their breeding does. Goats should not be allowed to become too thin or too fat. Reproductive failure can result if does are under or over conditioned at the time of breeding. Clinical symptoms of over or under conditioned does may include: low twinning and low weaning rates, pregnancy toxemia and dystocia. The term body condition refers to the fleshiness of an animal. Because the greatest potential for goats is to graze them with beef cattle, we have devised a 1 to 9 - point graduated scale, adapted from the beef system used in North Carolina. In this graduated scale, thin is 1 to 3, moderate is 4 to 6 and fat is 7 to 9. In most situations, goats should be in the range of 4 to 7 (Table 1). Scores of 1 to 3 indicate that goats are too thin, and scores of 8 to 9 are almost never seen in goats. The ideal body condition score (BCS) just before the breeding season is between a 5 and a 6 to maximize the number of kids born. Simply looking at a goat and assigning it a BCS can easily be misleading. Rather, animals should be handled physically. 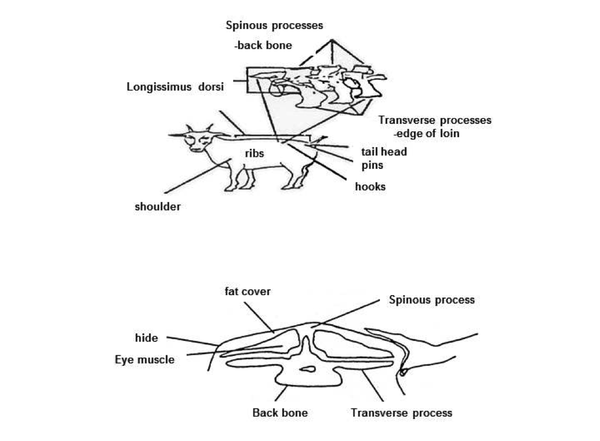 The easiest areas to feel and touch to determine the body condition of an animal are the ribs, on either side of the spine, by running a hand over those areas and pressing down with a few fingers (Figure 1). In doing so, one is able to determine the amount of fat covering the ribs. In general, does in good condition (BCS = 5 or 6) will have a fat thickness of not more than .05 to .08 inches over the loin and .03 to .05 inches over the backbone. In well-conditioned goats, the backbone does not protrude and is flush with the loin. Other areas to monitor are the shoulders, the tail head, the pins, the hooks, the edge of the loins and the backbone. Does in good condition (BCS = 5 or 6) have a smooth look and the ribs are not very visible. The backbone and edges of the loins are felt with pressure, but they are smooth and round and feel spongy to the touch. Some to significant fat cover is felt over the eye muscle. Does in poor condition (BCS = 4 or lower) look angular, the ribs are visible and the backbone and edges of the loins are sharp and easily felt. None to slight fat cover is felt over the eye muscle. Practice makes perfect, thus use your animals to get a feel for it. An easy way to start is to select a few animals that are over conditioned and some others that are thin in order to get a feel for extreme BCS. Then introduce a small group of animals and compare their BCS to the animals having extreme BCS. Producers should develop an eye and a touch for the condition of their animals and strive to maintain a moderate amount of condition on their goats. When body condition starts to decrease, it is a sign that supplemental feed is needed or that animals should be moved to a higher quality pasture. Waiting until goats become thin to start improving their feeding regime may lead to large production losses and will increase feed costs. Table 1. Body condition scoring chart. BCS 1 Extremely thin and weak, near death. BCS 2 Extremely thin but not weak. BCS 8 Obese. Animal is very fat with spinous processes difficult to feel. Ribs cannot be felt. Animal has blocky obese appearance. BCS 9 Extremely obese. Similar to an eight but more exaggerated. Animal has deep patchy fat over entire body. Pregnant does should not have a BCS of 7 or above toward the end of pregnancy because of the risk of pregnancy toxemia (ketosis) or dystocia. In addition, a BCS of 5 to 6 at kidding should not drop off to quickly during lactation. Body condition score is also used to determine whether flushing will be of benefit to breeding does. Flushing means increasing the level of feed offered to breeding does, mostly energy, starting about one month prior to the introduction of the bucks, to increase body weight, ovulation rate and hopefully litter size. Increasing the level of energy offered to does should continue throughout the breeding season and for approximately 30 to 40 days after removing the bucks for adequate implantation of the fetuses in the uterus. Does in extremely good body condition (BCS = 7) will not tend to respond to flushing. On the other hand, does that are in relatively poor condition (BCS = 4 or lower) as a result of poor feed quality and supply, high worm loads, late kidding of twins or triplets, will respond favorably to flushing by improving their body condition. Flushing can be accomplished by moving breeding does to a lush nutritious pasture 3 to 4 weeks prior to the introduction of the bucks. This cost-effective flushing method is underutilized in the Southeast where forage is abundant. Another method is feeding ½ lb/day of a high energy supplement. Corn is the grain of choice for flushing; whole cottonseed is another low cost, high energy and also high protein supplement. The goal being to increase the intake and body weight, breeding does should be grouped according to their body condition. Figure 1. Areas to be monitored for fat cover.